Ready for your annual reporting process cleanup? Check out our guide to make sure you don't forget any steps! Whether you use ClearPoint or another reporting tool to manage your strategy reporting process, it's important to take a step back and review the process at least once a year. 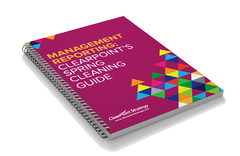 This guide takes you through the steps necessary for cleaning up your process and offers best practices for management reporting. Management reporting tips from our experts. Checklists to ensure you complete every step in the spring cleaning process. Links to ClearPoint Support articles to help you manaage your ClearPoint account. Download this guide now to ensure your reporting process and ClearPoint account are ready for a new year!